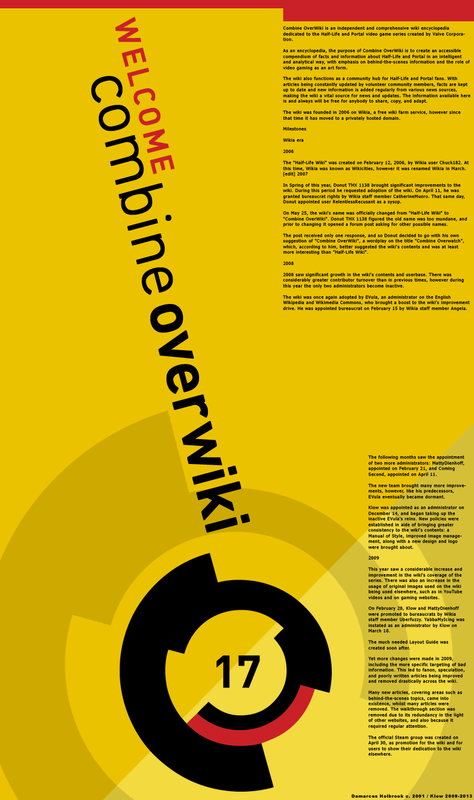 Combine OverWiki is an entirely community-driven project, consisting of community editors and volunteers, with the stated goal of providing an “accessible compendium of facts and information about Half-Life and Portal.” It covers a broad range of topics related to Half-Life and Portal, both in-universe and out of universe, including character, weapon, creature, location, creature or faction details, map lists, plot summaries, and information about Valve employees. First created in 2006, Combine OverWiki was originally hosted by Wikia, but separated from them in 2012. The separation effectively split the wiki into two; while the Wikia version remained, floundering in a ugly and advertisement-plagued state, currently partially named ‘Sector W,’ Combine OverWiki went independent. The OverWiki is currently hosted by the Valve community news site Valvetime.net, with the general consensus being that the OverWiki has an overall higher standard of content and a far cleaner site design than its Wikia counterpart. While free to edit even without registering, Combine OverWiki contains three main categories of editors, each with different abilities and responsibilities: administrators, rollback editors, and regular editors. Administrators are essentially the ‘leaders’ of the wiki, holding the most responsibility; selected on an ‘as-needed’ basis, they are in charge of maintaining the wiki in general, holding the ability to ban abusive users or IPs, protect and delete pages, and more. There are currently six active administrators on the OverWiki: Barnz, Bramblepath, Klow, Marphy, Sandvich18 and SiPlus. Among these admins, Klow and Bramblepath are bureaucrats, responsible for paying for the site hosting, and with the additional abilities to promote users to administrator or grant users rollback rights. Klow is also managing the social side of the wiki through Facebook, Twitter, YouTube, Steam, etc. and answers to the comments posted there. Rollback editors are users that have been granted special rights by bureaucrats, and have the ability to protect pages and easily reverse bad edits, in order to help combat vandalism and spam. The three current rollback editors on the OverWiki are Erickos, JgcxCub, and Vic. Finally, there are the standard registered and non-registered editors who, while having fewer abilities and responsibilities than administrators or rollback editors, are no less important to the website. While users are free to edit while unregistered, their IP addresses will be on display in the ‘recent changes’ section, and not all pages will be accessible. Registering, however, is free and easy, and grants users additional benefits such as talk pages. There are currently dozens of editors, me included, who work tirelessly alongside the rollback editors and admins in order to maintain the wiki’s high quality. The OverWiki is currently undergoing two large-scale projects, with the aim of bringing the entire wiki up to a consistently high level of quality: the Cleanup Project and the Portal Project. The Cleanup project is a general maintenance project intended to ‘clean up’ articles that are of a lower quality. This could include fixing unreliable information, sourcing unverified information, cleaning up the format of an article, or fixing grammar and sentence structure. 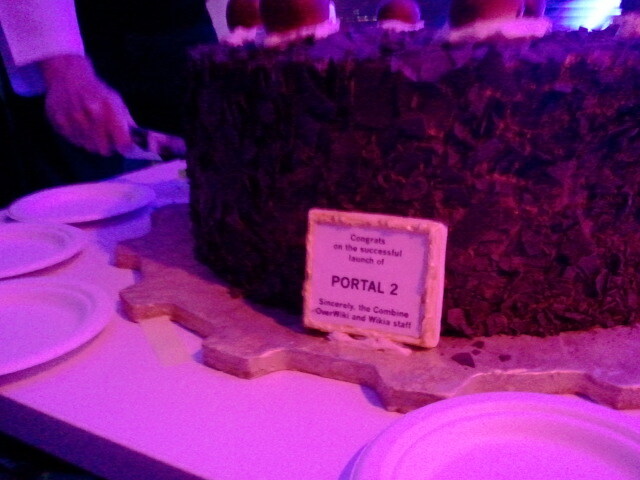 The Portal project is a similar maintenance project to the Cleanup project, focusing however on cleaning up articles related to the Portal series. More projects will come in the future, mostly concentrating on the Half-Life series. ‘Safe’ articles are considered clean, but have little content. ‘Good’ articles are of high quality, with more content that the Safe ones. ‘Featured’ articles are articles than have gone through extensive review, and are considered exemplary, with insightful information, no spelling or grammatical errors, and sources, among other requirements. While bad edits and vandalism are forbidden on Combine OverWiki, the site administrators are not above playing humorous pranks on OverWiki users at times, as seen by their various April Fools Day jokes. Being a non-profit community-driven project, a lot of work goes into both paying for server hosting, and maintaining the quality of the articles, as well as expanding on it with new and useful information. Combine OverWiki absolutely needs the support of the community in order to survive, as maintaining a high-quality independent wiki, with absolutely no advertisements, is neither cheap nor easy. Fortunately, there are many ways you can contribute to it. In order to help the site’s two current bureaucrats, Bramblepath and Klow, in maintaining the site and paying for the hosting, it is possible to donate to the OverWiki. Such donations are much appreciated for the general maintenance of the site. You can also feel free to join the site’s Steam Group and Facebook group, or follow the site on Twitter, to show your support. How else can you contribute? It’s simple: edit! By far the most valuable contribution you can make to the OverWiki is to provide useful, insightful information, and help to spread your knowledge. Wikis are unique in that they are constantly evolving, as new information is added, and can be edited by anyone; this allows for the quick and easy spread and access of free knowledge and information. Absolutely any useful edits are appreciated, and even something as simple as fixing a grammar mistake in a sentence goes a long way towards helping the OverWiki. If you have any interest in the OverWiki or its goals then the most important thing you can do is to contribute information. I would like to express my utmost gratitude and appreciation to the dedicated team of editors who made the OverWiki what it is today, without whom this excellent site would not exist. There is much work to be done, however, and it must come from the community. 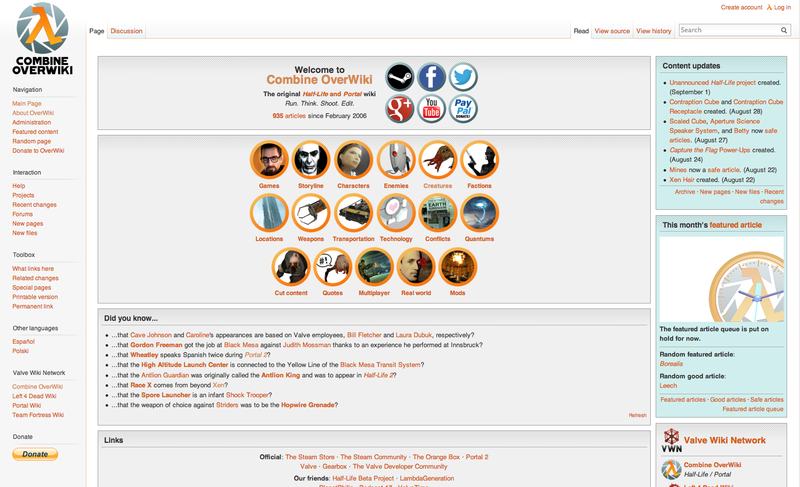 The OverWiki is entirely by the community, for the community, and while I would not have it any other way, such a project demands a degree of participation and effort from the Half-Life and Portal fanbase in order to maintain its current high quality. It’s up to you, Half-Lifers! Still no Hercule Cubbage article over at the OverWiki. How embarrassing for them! Joking aside, I’ve spent dozens of hours scouring through that. Sometimes I find it useful to confirm some info, but mostly it’s just a great source of inspiration. My thanks to the entire Combine OverWiki team for the great job they’ve done over the years, it’s a fantastic and extremely helpful piece of work. Combine OverWiki does not really create pages for un-official creations or content, only some main mods. http://combineoverwiki.net/wiki/Category:Fan_content is all there is so far. You shouldn’t expect to see any fan comics like your own on there (Concerned seems to have been lucky enough to get itself on, but that’s about it). Also bare in mind it is an open, free and independent Wiki, so you shouldn’t expect anyone other than yourself for being responsible for posting information on your own creations. Great article, I think it is important to highlight this wiki as it seems a lot of people still don’t know the difference between it and the old Wikia site. Yeh, and the fact the the old Wikia wiki uses pretty much all of Combine Overwiki’s content, including images, which they allowed. Big respect to Overwiki for doing that though, even though Wikia sort of ripped them off by polluting it with ads and all sorts of other technical headaches.